H- Yep, for most of you that know me, I’m sure it is no surprise that H is for Hydration. We have previously blogged about the importance of staying hydrated and the consequences of dehydration in the Impetus quite a few times. Life cannot exist without water! We are water-based beings, comprising about 70% of our body. It is the most important nutrient we consume every day of our lives. Humans can live up to 40 days without food but can die in three days without water. Water is not just a beverage choice. However, many of us choose just about everything else to drink other than water. Researchers estimate that about 75% of people in the US have a mild chronic dehydration. This can lead to many health issues such as fatigue, joint pain, weight gain, headaches, ulcers and high blood pressure. Chronic dehydration may affect your organs and lead to kidney stones, cholesterol problems, constipation, and liver and muscle damage. What if you could reduce or alleviate these symptoms by just drinking healthy water? As part of our Wellness Home our choice for healthy water is Nikken PiMag water from our Nikken Waterfall. The most efficient and cost-effective way of providing yourself and your family is filtering tap water. The Nikken PiMag Waterfall® converts tap water into fresh spring-like water. Using a multistage process which filters, alkalizes, mineralizes, ionizes, energizes and oxygenates water. The Waterfall provides great tasting water which is easy to use, affordable and a healthy water choice. Water the way nature intended it. I- For this letter let’s talk about Immunity and ways that through Self Care and the Wellness Home we can have healthy immune systems. One night of poor quality sleep or insufficient sleep can drop your immune efficiency as much as 60%. Sleep deficiency and stress overload increase the hormone cortisol, prolonged elevation of which suppresses immune function. Sleep is not only about how many hours we sleep, but more importantly about quality of sleep that we are receiving. A significant component of sleep quality is dependent on our sleep environment. For that reason, the foundation of the Nikken Wellness Home and our personal choice, is the Nikken Kenko Sleep System. Part of our Wellness Home includes Kenzen® Immunity. This product is a combination of 14 different mushrooms, including rare varieties not available in conventional mushroom products. Increase your consumption of vegetables, fruits, nuts, and seeds, which will provide your body with the nutrients your immune system needs. A study in older adults showed that boosting fruit and vegetable intake improved antibody response to the Pneumovax vaccine, which protects against Streptococcus pneumonia. The Wellness Home provides a number of consumable products just for this reason. Jade GreenZymes® and Kenzen Super Ciaga® are ideal for busy people to provide their bodies with healthy vegetable and fruit consumption in a fast, easy, economical way. Studies indicate probiotic supplements reduce the incidence of respiratory and gastrointestinal infections. One serving of Kenzen Vital Balance® provides more probiotics than 10 servings of yogurt and is part of our daily regimen. Prebiotics and probiotics support gastrointestinal and immune system health. * In our Wellness Home, we look forward to starting each day with a delicious shake. J- We will end this week’s discussion with the letter J for Joint Health. 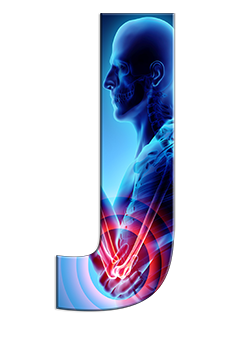 It is estimated that 1/3rd of Americans suffer joint pain. These can be mild to severe depending on the condition. Many times, this relief can be as simple as drinking more water and staying Hydrated. In other cases, anti-inflammatory medication either prescription or over the counter products are used. The Wellness Home provides natural solutions in the form of Nikken Magnetic Support products and KenkoTherm® Support Wraps. In our home we routinely use them for joint issues. These are supportive and comforting and can be worn while playing sports or other activities. Another staple in our Wellness Home is CM Complex Cream. Whether you're a seasoned athlete or just a weekend warrior, Nikken CM Complex Cream can help soothe the discomfort that comes from living an active life. CM Complex and Kenzen® Joint is endorsed by the estate of Dr. H. W. Diehl, the National Institutes of Health researcher who discovered cetyl myristoleate. I trust that our readers are getting the message that the Nikken Wellness Home is a multi-faceted solution for many of our requirements to be healthy and a simple solution to many health issues. It’s main focal point is that it makes healthy choices easy on a day to day basis so we can all Be Healthy by Choice.